He said Shiv Sena, the ruling ally of the BJP in Centre and state governments, is not even in the reckoning for the civic polls, scheduled on October 11. Nanded: Voting for the Shiv Sena in the upcoming Nanded-Waghala Municipal Corporation polls would mean bringing the Congress to power, Chief Minister Devendra Fadnavis said here today while launching a vicious attack on the Uddhav Thackeray-led Shiv Sena party. Addressing a public rally, Chief Minister Fadnavis also didn't spare sitting Member of Parliament (MP) and Congress stalwart Ashok Chavan, who has parked himself in the constituency to ensure that his party retains the civic body. 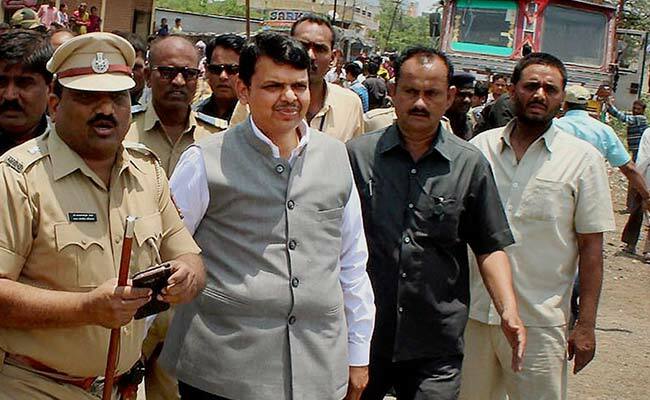 Chief Minister Fadnavis' attack on the Sena came a day after Mr Thackeray dared the BJP to "resign" from the Maharashtra government and face mid term polls. Mr Thackeray had also slammed Prime Minister Narendra Modi over his visit to Gujarat, which he dubbed a "poll campaign". "Entire Maharashtra is standing behind the BJP today. In the recent elections to 16 municipal corporations, the BJP came to power in 13. There is no trace left of the Congress. As far as the Sena is concerned, it is not even in the race here. So I do not feel the need to say anything much about them," Chief Minister Fadnavis told the gathering. He recalled that the Sena had joined hands with the Congress against the BJP when the party was voted to power in Aurangabad municipal corporation polls. He said Sena had sided with the Congress in Jalna, Parbhani and Hingoli civic bodies as well. Attacking the Sena, which has been firing salvos at Prime Minister Modi and the BJP-led NDA governments at Centre and state despite being an alliance partner, the Chief Minister said the Thackeray-led party had also helped the Congress in securing a victory in Nanded Zilla Parishad (ZP) polls. "Sena is not fighting in Nanded to win but to ensure that the BJP loses the election. Voting for them (Sena) means giving direct votes to the Congress. The Sena is in the poll fray only on the directions of the Congress," the CM said. Chief Minister Fadnvais said the BJP came to power in 18 states because of "good governance" under the leadership of the Prime Minister. "In Modiji, people have got a leader who actually works for the poor. In the last 70 years of the Congress rule, they could not even provide people with houses. But under Modiji's vision, he has promised housing for all by 2022. He does not merely talk but the construction of crores of homes across the nation has already started," he said. The Nanded civic polls is viewed as a litmus test for former Chief Minister and current state Congress unit president Ashok Chavan, whose father late Shankarrao Chavan, a former defence minister, had nurtured the constituency over years. The 81-member civic body is currently controlled by the Congress. In the 2012 polls, the Congress had won 41 seats, Sena 14, BJP 2, NCP 10, MIM 11, Others (2), Independent 1. Out of 81 seats, 41 seats are reserved for women candidates, 15 seats for SC candidates, 2 for ST and 22 seats for Backward Class communities. The counting of votes will be done on October 12 and results will be declared on the same day. A total of 578 candidates are in the poll fray. Meanwhile, targeting Mr Chavan, the CM said, "As many as 50,000 people in Nanded lack a proper house to live. In all these years of power, the MPCC president only cared about himself". He said various civic works and the condition of roads in Nanded would have been better had the funds been allotted to "right people" and not "laundered". "If Rs 300-350 crore had been allotted to right people and the money was not laundered, it would have been ensured that all roads in Nanded are of good quality. No money would have been needed for the next 20 years, but they (Congress) were interested only in taking commissions," the CM alleged.